Hi, all! 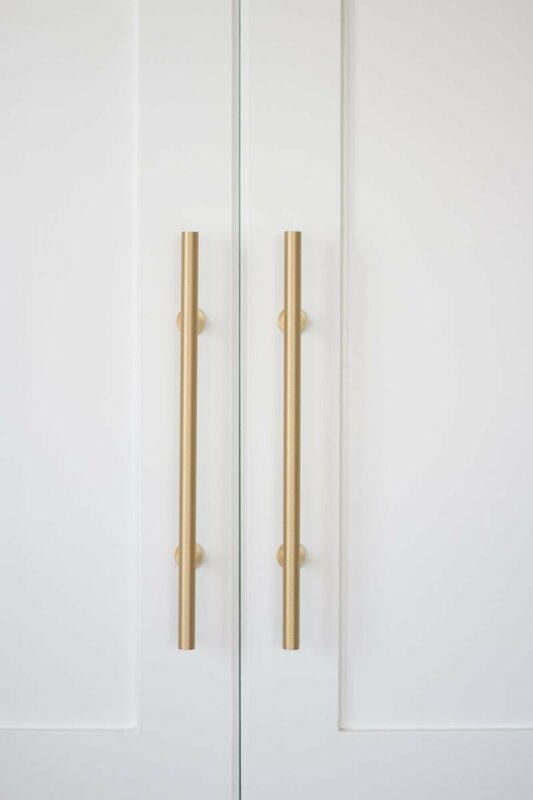 Super excited to share some of the behind-the-scenes photos of our renovation progress. We had time prior to moving in to make some changes. Knowing we were fortunate to have that time, we wanted to get the biggest bang for our buck so we lightened everything up and gave it a fresh look. 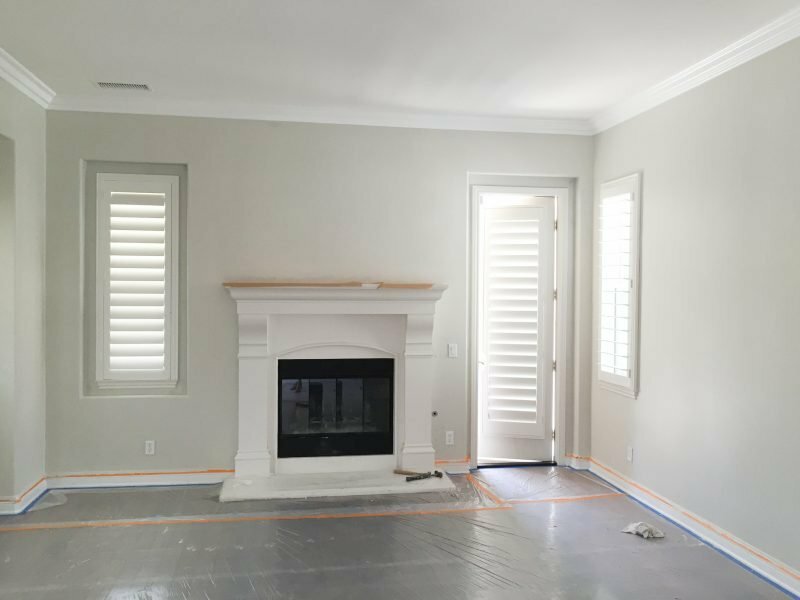 We chose to go with a white kitchen and pale gray walls. Here is a bit of how the process occurred. Oh, and if you missed the before photos of the downstairs, you can see them all here. One of the reasons we fell in love with this house is because of the great room and the layout of this kitchen. It fits our family so well. The shaker style cabinets were beautiful to begin with and we knew having them lacquered would really make it blend well with the pretty woodwork throughout the front of the house. So off came all of the doors and the priming began. When you are painting over such a dark color, it’s imperative to prime before spraying with lacquer. Otherwise you run the risk of them appearing PINK over time. Not really our style. Ha. Just seeing the primer go on made me absolutely giddy. What a difference. 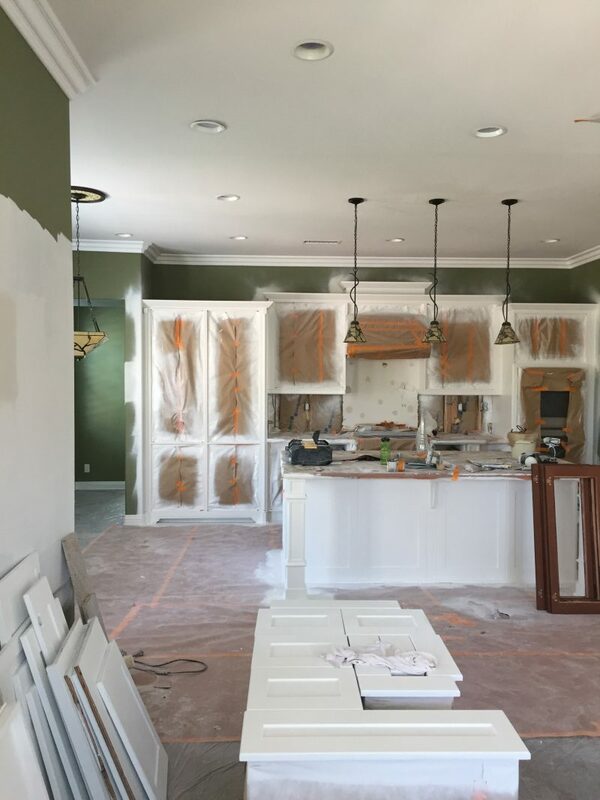 Fast forward to the cabinets being done (except for the doors going back on) and the Pale Oak (by Benjamin Moore) on the walls. It really is my all time favorite color to paint a house and I have always wanted to have it throughout my own home. I can go crazy with color through textiles, decor and furnishings but we really wanted our long-term home to be a blank canvas. Hiccup #1: For me, the built ins really took on a dramatic change. Have you read, ‘If You Give a Pig a Pancake?’ Well in this case, if you paint your cabinets white, your built-in puck lights no longer match. Oops. So the hunt was on to find white covers to replace them. To no avail so we had to replace them altogether. The joy of renovation. . . the budget gets pushed here and there with unexpected twists and turns. Always try and set aside funds for things you didn’t expect. Hiccup #2: That time I decided I only wanted two pendants above the island rather than three. You know what that means, right? You have a hole to patch and paint. And if you have a hole to patch and paint you better know the ceiling color used years ago. Well we didn’t. And when it was matched it was all kinds of wrong. Notice how much darker? The painters were almost done with it when they called me to come and look. Ummmm?! I stood there staring at the ceiling knowing it wasn’t ok. But they had worked hard and were so wanting me to say it was fine. After all they had purchased 5 gallons of it to paint the interiors of the closets in the house. The people pleaser in me wanted to say, “Sure! It’s great.” But the reality was that it was going to be a different color than all of the other ceilings in the home and would forever bother me. They graciously worked hard to figure out a closer match and we were once again on a roll. But if you are the contractor on your own job site, you have to pay attention and you have to speak up for yourself. It’s your money and it’s your home. I’ve learned over the years to always go with your gut if you know something is off. Oh, and we ended up using the 5 gallons in the closets. It is still white just a bit warmer and who cares with it being in the closets. That saved us from having to waste the paint and buy more. And here is a peek at Pale Oak (first coat) going on elsewhere in the house. 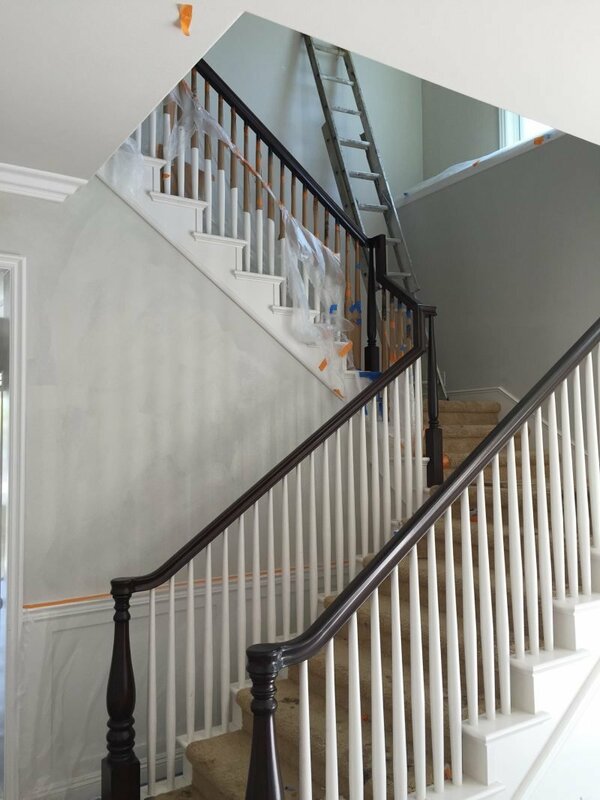 We also had the handrail stained darker to create more of a contrast. It had faded in so many spots so it was ready for a fresh coat. It’s little things like that which end up making a pretty significant difference in the end. And here is the front room taking shape! The fireplace needs some fresh paint but I will do that on my own. I tried to go with the things that would be too hard for me to accomplish all on my own. Painting a fireplace has my name written all over it! And just a little sneak peek! Can’t wait to show you how it’s shaping up. Stay tuned. Thanks for stopping in to check out our renovation progress. We are in the home stretch of moving. Unpacking is an entirely different beast. (Before photos here). Awe. Thank you! Thanks for taking the time to check in with the progress. Oh wow, it is looking amazing. Can’t wait to see it all put together. Thank you very much. It’s been an exciting process. Trying to take our time and enjoy the chaos as this won’t be happening again. Have a great week, Marty. It looks so amazing so far!! I hear ya on the ceiling paint. I’ve been down that hole and then suddenly the canned lights don’t match. One thing leads to another. Definitely a smart move to go from three down to two pendants. I’m wanting to do that in our home someday too. I’m loving the new paint color! Thank you so much. Happy to hear I am not the only one who got herself in a ceiling predicament. In my head switching to two pendants was so easy. Just take one day. Ha! Live and learn. Hope you are doing great, Sarah. AWWW all the heart eyes for that hardware!! WOW!!!!! So exciting!!! I was thinking that you were leaving the kitchen dark for some reason. I was super excited to see the white!!! I love my white kitchen and I don’t think I will ever go dark:) The paint color is amazing! I can’t wait for more pics!!!! You must just be itching to decorate!!! Enjoy!!!!! I LOVE hearing that about your own kitchen. Thanks so much for the sweet comment. And you are so right. I am very anxious to get to the decorating part but boy oh boy it may be a while with how slowly our unpacking (or lack there of) process is going! Have a wonderful day, Jeannie. It looks so different already! I love the Pale Oak, and plan to use it when we repaint. The stairs are much more dramatic with the darker stain. I hear ya on the ceilings. 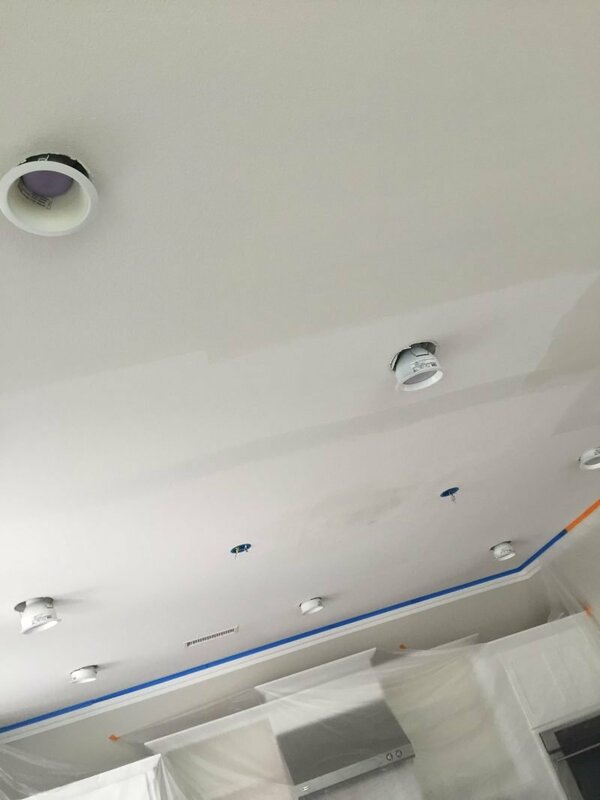 We need to have our can lights in our family room switched out, but were told to plan on painting at the same time. UGH!! WOW what a major transformation and all just from paint! I need to get a sample of Pale Oak for our bedroom, that might be what I’m looking for. 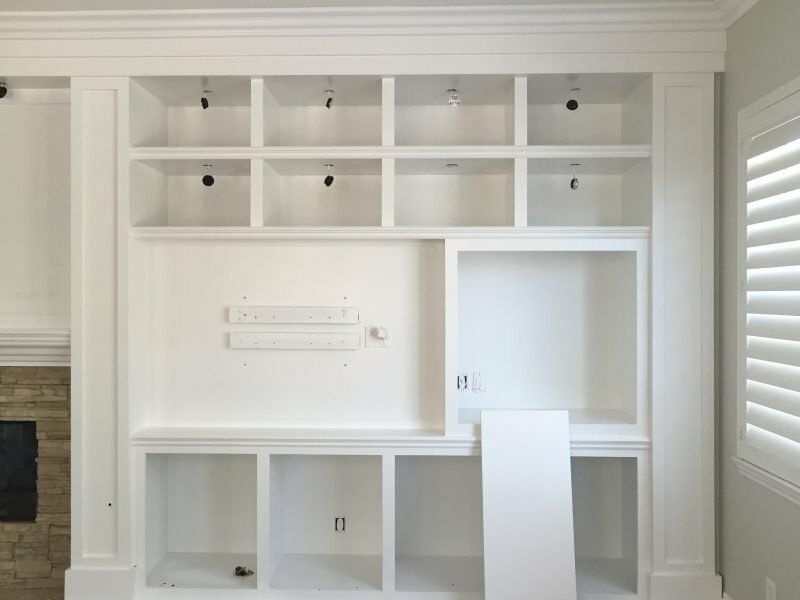 Did you paint the cabinets yourself or hire someone? I have dark shaker cabinets as well and have wanted to do this for a very long time. It looks fantastic Courtney! So pretty and fresh! Paint is amazing. You have turned us on to Pale Oak. We used it in our house and continue to use it. Your new hardware looks gorgeous!! So excited for you and your family, Courtney! Thanks for sharing your journey with us. Would you kindly refer your paint contractor? We’re looking for a local painter to refinish our kitchen cabinets as well. 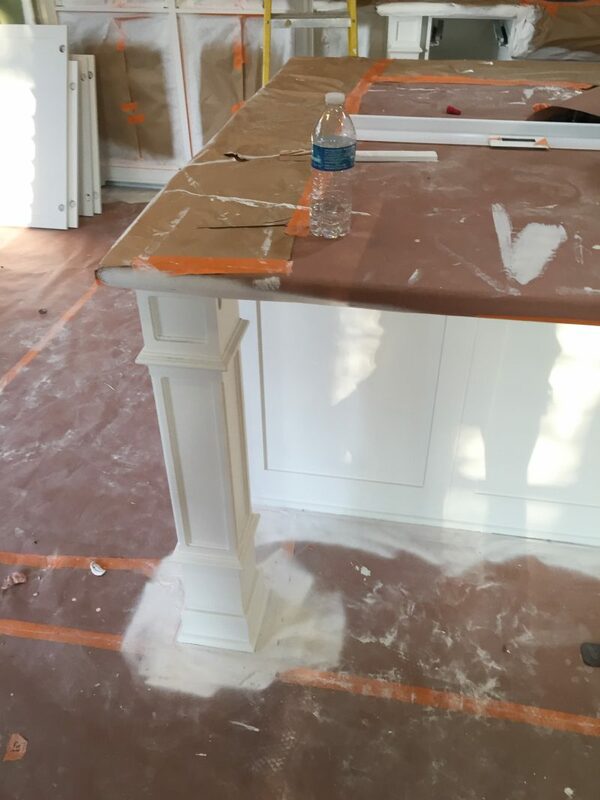 Can you share the paint you used for the cabinets? Color, Brand, Finish? Thank you, in advance. Everything is looking amazing!! Wow so amazing! Would also love to know the paint color for the white kitchen cabinets? Also stain color on banister handrail! Everything is so lovely and I’m enjoying following along! I love the updates you’re making! The cabinets are going to look awesome!! So happy to be following along as you make this new house home. Can you share your hardware source? WOW!! I cannot believe the different a little bit of paint and white make – so stunning already!! And those handles?? Too die for! Looks amazing already! I knew it would, but somehow seeing it is even better than imagined. Can’t wait to see final reveal. I’m also curious about the cabinet painting. Is there a difference between regular paint and lacquer? we’ve been in our “new” (to us) house for 2 years and painting the 90s oak cabinets white is at the top of our list. My only hesitation is that they’re going to clip or get “sticky” with humidity (we live in the northeast and don’t have central a/c). We painted our walls balboa mist which I think is close to pale oak. Anyway, love how it’s coming together…awesome house! Wow. So bright and airy! Love it. Enjoying following you on your journey as you make this your new home. I love your fashion posts! LOVE the painted cabinets! We are facing our own kitchen dilemma right now deciding whether to paint our cabinets or do a full replacement. The cabinets are only 10 years old and there is nothing really wrong with them. 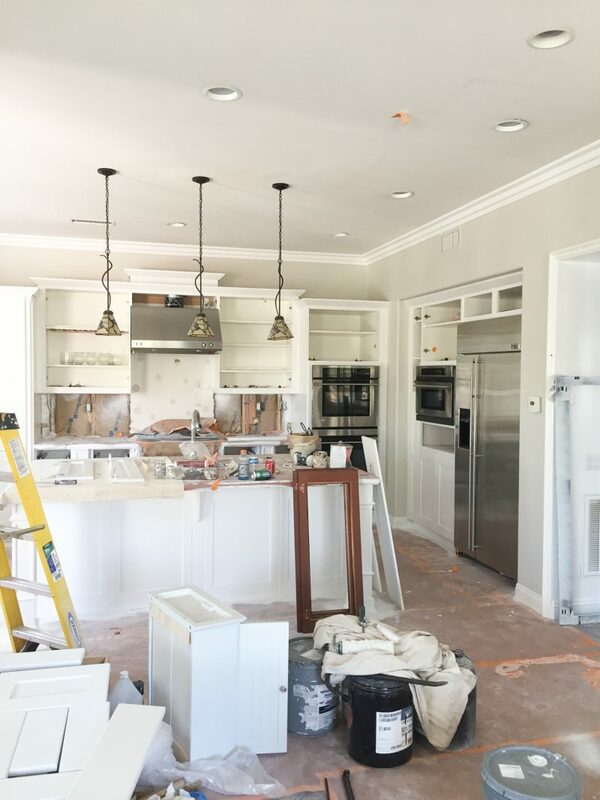 However, the style is not what I would want now, there’s one wall of cabinetry that pretty much annoys me every day, and the crown molding detail is way too busy for my taste now, BUT…the cost of an entirely new kitchen hits the checkbook big time! Anyway, how did you go about finding someone to paint the cabinets? I would assume it’s not just your run of the mill painter. I’d like to explore all of my options before jumping in. Thanks! Can’t wait to see more progress of your new home! This looks so great! Fresh paint really can be a game changer. Any chance you would want to share the dark rail color? Keep the updates coming. I can’t wait to see more. It is looking beautiful, Courtney. I can’t wait to it when it’s finished. I absolutely love the wall color, your home is beautiful. I am struggling with choosing a wall color for our remolded basement and would love this color. The couches are chocolate brown though, do you think it would still work?